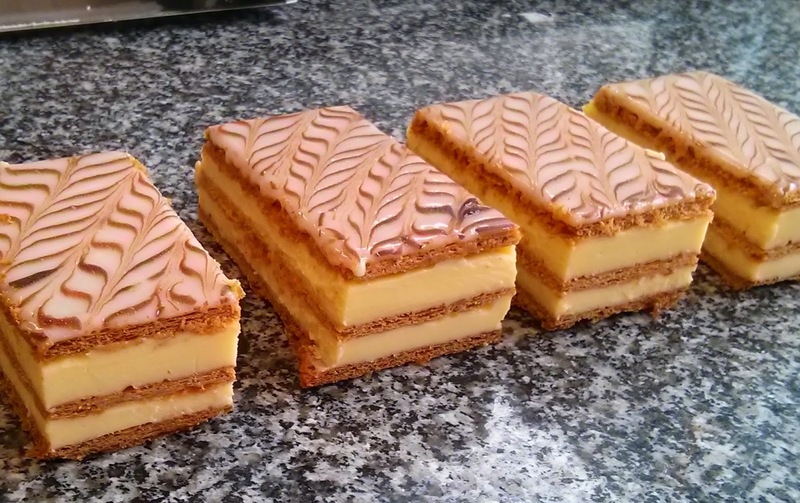 Mille feuille, marbrage au fondant blanc. (Created in 1869 by a Parisian French chef called Sergent). A classic of French pastry tradition: le mille feuille (literal translation: thousand of sheets). The puff pastry dough is baked between two flat plates to make sure it doesn’t develop too much and it stays very flat. It’s then shaped in 3 identical layers that will be assembled with some “crème patissière” (custard cream). The last puff pastry rectangle will then be covered with a thin layer of sealing sirop. At this point we can glaze it with a fondant blanc, and decorate it with melted chocolate. After some time in the freezer we can shape it in nice rectangles. By the way the ones on the picture above were still freezed that's why the cream looks so hard. This is a common but pretty tasty dessert with two main textures: crusty and creamy. Some people don't like the fondant icing. I Personally think it brings a third texture and some sugary but discrete taste to the mille feuille. As a kid this used to be my favorite birthday cake. - Assemble the 3 rectangles alternating with the pastry cream. Glaze the last layer of puff pastry with the white fondant and very quickly, make parallel lines of dark chocolate to finalize with a little knife to make the fondant drawings (check the video for more details). I have made the puff pastry for 3times according to your folding method, because I like it very much . But I do not know why my pastry not flakier and heavy layer inside ,just like shortcrust . my flour is pastry flour .